The following steps summarize the renewal/rebinding process. Obviously, the exact sequence of operations taken by a client depends on what happens in its attempts to contact a server; for example, if it is successful with renewal, it will never need to attempt rebinding. An example renewal and rebinding is illustrated in Figure 265. Note also that the same notes about addressing fields, relay agents and such that I mentioned in the allocation process topic apply here as well. 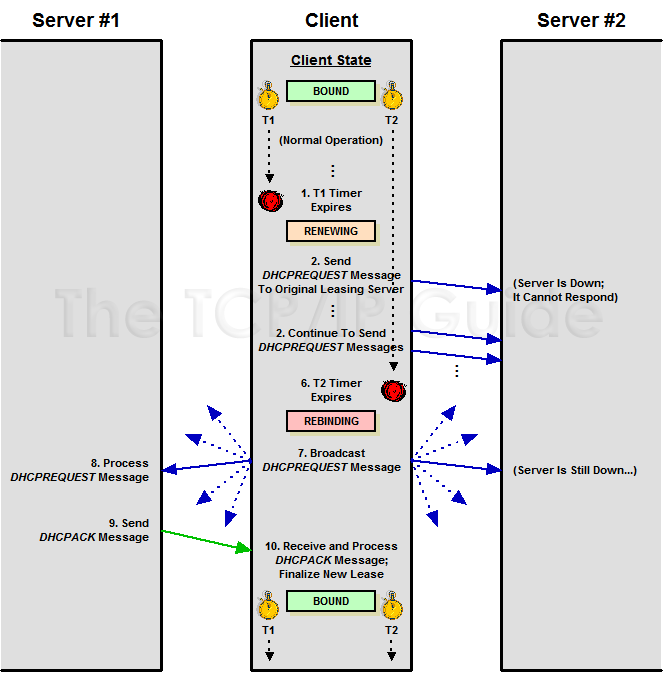 This diagram shows the example of a client that presently holding a lease with Server #2 attempting to contact it to renew the lease. However, in this case, Server #2 is down for maintenance. The server is unable to respond and the client remains stuck at Step #2 in the renewal/rebinding process. It keeps sending DHCPREQUEST messages to Server #2 until its T2 timer expires. It then enters the rebinding state and broadcasts a DHCPREQUEST message, which is heard by Server #1, which in this case agrees to extend its current lease. The renewal timer, T1, is set by default to 50% of the length of the lease. When the timer goes off, the client transitions from the BOUND state to the RENEWING state. Note that a client may initiate lease renewal prior to T1 timer expiration if it desires. The client creates a DHCPREQUEST message that identifies itself and its lease. It then transmits the message directly to the server that initially granted the lease, unicast. Note that this is different from the DHCPREQUEST messages used in the allocation/reallocation processes, where the DHCPREQUEST is broadcast. The client may request a particular new lease length, just as it may request a lease length in its requests during allocation, but as always, the server makes the final call on lease length. Server Agrees To Renew Client Lease: The server decides that the client's lease can be renewed. It prepares to send to the client a DHCPACK message to confirm the lease's renewal, indicating the new lease length and any parameters that may have changed since the lease was created or last renewed. Server Refuses To Renew Client Lease: The server decides for whatever reason not to renew the client's lease. It will create a DHCPNAK message. The server sends the DHCPACK or DHCPNAK message back to the client. Positive Acknowledgment: The client receives a DHCPACK message, renewing the lease. The client makes note of the new lease expiration time and any changed parameters sent by the server, resets the T1 and T2 timers, and transitions back to the BOUND state. Note that the client does not need to do an ARP IP address check when it is renewing. Negative Acknowledgment: The message is a DHCPNAK, which tells the client that its lease renewal request has been denied. The client will immediately transition to the INIT state to get a new leasestep #1 in the allocation process. If the client receives no reply from the server, it will remain in the RENEWING state, and will regularly retransmit the unicast DHCPREQUEST to the server. During this period of time, the client is still operating normally, from the perspective of its user. If no response from the server is received, eventually the rebinding timer (T2) expires. This will cause the client to transition to the REBINDING state. Recall that by default, the T2 timer is set to 87.5% (7/8ths) of the length of the lease. Having received no response from the server that initially granted the lease, the client gives up on that server and tries to contact any server that may be able to extend its existing lease. It creates a DHCPREQUEST message and puts its IP address in the CIAddr field, indicating clearly that it presently owns that address. It then broadcasts the request on the local network. Server Agrees To Rebind Client Lease: A server has information about the client's lease and agrees to extend it. It prepares for the client a DHCPACK message to confirm the lease's renewal, indicating any parameters that may have changed since the lease was created or last renewed. Server Decides Client Cannot Extend Its Current Lease: A server determines that for whatever reason, this client's lease should not be extended. It gets ready to send back to the client a DHCPNAK message. Each server that is responding to the client sends its DHCPACK or DHCPNAK message. Negative Acknowledgment: The message is a DHCPNAK, which tells the client that some server has determined that the lease should not be extended. The client immediately transitions to the INIT state to get a new leasestep #1 in the allocation process. If the client receives no response to its broadcast rebinding request, it will, as in the RENEWING state, retransmit the request regularly. If no response is received by the time the lease expires, it transitions to the INIT state to get a new lease.